It is located inside a grain silo built on Cape Town's waterfront in the 1920s, which was once the city's tallest building. Heatherwick's team have carved huge sections out of the building's tubular interior to create a complex network of 80 gallery spaces. "It became like archaeology, like excavating out gallery spaces, but not wanting to obliterate the tubularity completely," Heatherwick told Dezeen. "We realised we needed to do something that your eye couldn't instantly predict," he explained. "Our role was destructing rather than constructing, but trying to destruct with a confidence and an energy, and not treating the building as a shrine." The museum is one of several facilities that Heatherwick Studio is creating within the grain silo building, which forms part of the V&A Waterfront, a harbour-side complex filled with bars and restaurants. The development also includes a hotel, which is already open. 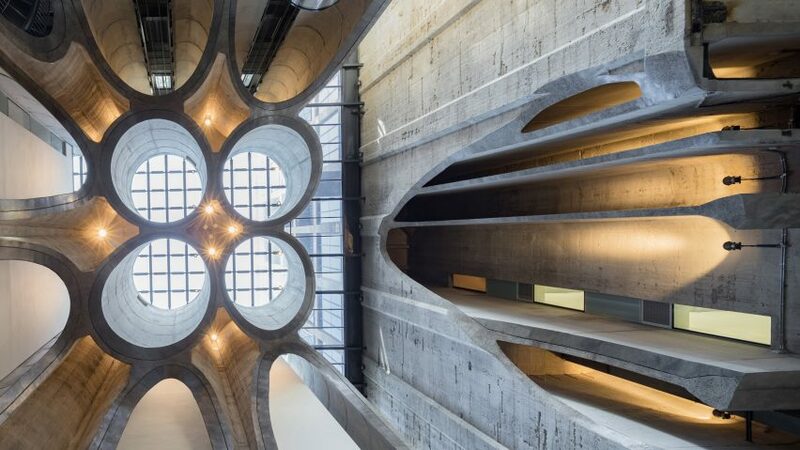 However creating Zeitz MOCAA was by far the most complex part of the renovation. The museum centres around a huge atrium, based on the shape of a single grain that was scaled up to span the full height of the 27-metre-high structure. Heatherwick describes the space as being "like a vaulted cathedral". "We were interested in how we could give a heart to the building," he said. "The curator was quite clear that the tubes were pretty rubbish for showing art in, so [the challenge] was how we could retain the spirit of this tubularity but also give functionality, to create an A-grade gallery space." In the places where tubes were cut back, the edges were polished to create a visible contrast between the rough aggregate of the old concrete. Laminated glass was also added to give a mirrored finish, and features a fritted pattern designed by the late African artist El Loko. This atrium provides access to all of the exhibition spaces, which total 6,000 square metres. Externally, the building features bulging windows – formed of faceted glass panels. Positioned within the existing concrete frame, these draw light down into the atrium, while also offering a kaleidoscopic visual effect. "They act slightly like mirror balls, " said Heatherwick. "You look up at them, they're reflecting back at you, but the side part reflects Table Mountain, the other side part reflects Robben Island and the top part reflects the clouds in the sky." Heatherwick ranked at number 23 on the inaugural Dezeen Hot List. Although he trained as a designer, he has worked on a number of architectural projects, including a Singapore university building and a visitor centre for British gin brand Bombay Sapphire. He has had a run of bad luck recently, with the cancellation of both his Garden Bridge for London and his Pier 55 park for New York. But he has more projects in the works, including a tree-covered development in Shanghai and a honeycomb-like structure for New York.